Camping has become more and more popular in recent years, in large part because it provides a welcome respite from the constant temptation to keep on staring at screens. It also provides a powerful reminder of what is really important and how insignificant most of our day to day concerns really are. Having recently returned from an extended camping trip – firstly for a long weekend with a group of friends including several of the 100%Open team, and then latterly with my immediate family for another week – I’ve been reflecting on how the camping experience represents a very different way of living and working from which I think we can learn a great deal. 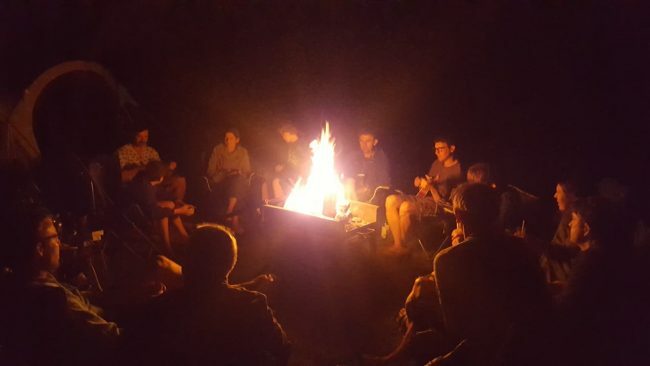 Whilst we were away I noticed several parallels between the camping experience and the types of networks that I think we need to build, that can be distilled into four core components, namely i) the basics ii) the participants iii) the community and iv) the campfire. When camping, somebody needs to provide the right space in an attractive location together with some level of facilitates such as toilets and showers. In contrast, networks need to provide the right digital or physical space for people to come together with an attractive vision that people want to be part of, perhaps with some additional facilities to help the conversations to continue and grow. As a visitor to a campsite you need to bring your own shelter and food, which provides not only the basic ingredients for survival but also provides some personal space and self-sufficiency, without which we would not last in the wilderness for very long. Likewise as a member of a network, we all need to bring our own skills and experience together with our own ability to inspire ourselves and others as well as a desire to learn and solve problems. Much of the joy of camping comes from a community coming together. People will come and go and make new connections and friends on a daily basis if they want, or alternatively keep themselves to themselves if they prefer. Likewise, as part of a network we all have to build and maintain our own connections on an ongoing basis to people we trust, like, respect. Group decision making whilst camping often appears non-existent, but in reality the decision to do something as simple as “going for a walk” are triggered by a conversation between a few people who fancy it, and then others choose to join in or not depending on how they feel. Likewise most networks are coalitions of the willing, where people are largely self directed in their decisions but on occasion a few people trigger a new direction and then others choose if they want to join in. Of course if people don’t contribute appropriately to the community, they simply won’t be invited again, or others will choose to move the camp elsewhere. This moderation of inappropriate behaviour is aided by the inherent impermanence of the camping experience and of networks themselves. Lastly, for me camping is all about sitting around a campfire, and staring endlessly and alternately into the flames and at the stars (if you are lucky with the weather). The campfire provides a focus and an opportunity where we can come together and just be together. To transcend ourselves and go beyond our day to day thoughts and concerns. To connect and collaborate and co-exist. It also provides a space to share food, share stories and maybe even singing a few songs together if the spirit moves you. With that in mind the Ukulele has become my new latest camping essential in recent years. Likewise a network also needs a metaphorical fire that burns and draws people to it. The fire always requires feeding and tending, just like we all do, otherwise it will go out. This campfire can be as mundane as the regular gatherings or something more adventurous as joint missions and collaborations. Networks are inherently transient and often lack the gravity to sustain lasting change. Yet at any moment in time a network is more powerful than any hierarchy and we live in liminal times where there are no shortage of economic, social, environmental and political challenges that transcend organisations and require us to pool our collective talents for the greater good. So as I have return from camping to a more familiar normality of day to day life and work, we’re also thinking about how we are evolving and revolving at 100%Open as well, which like camping is an ever changing experience. Sometimes it is necessary to take a step back in order to move forwards. And it’s always preferable to change before you have to, rather than wait until it’s too late. So with that in mind we will take things one step at a time and connect the dots as we go. May all of your campfires keep on burning and thank you as ever for reading. 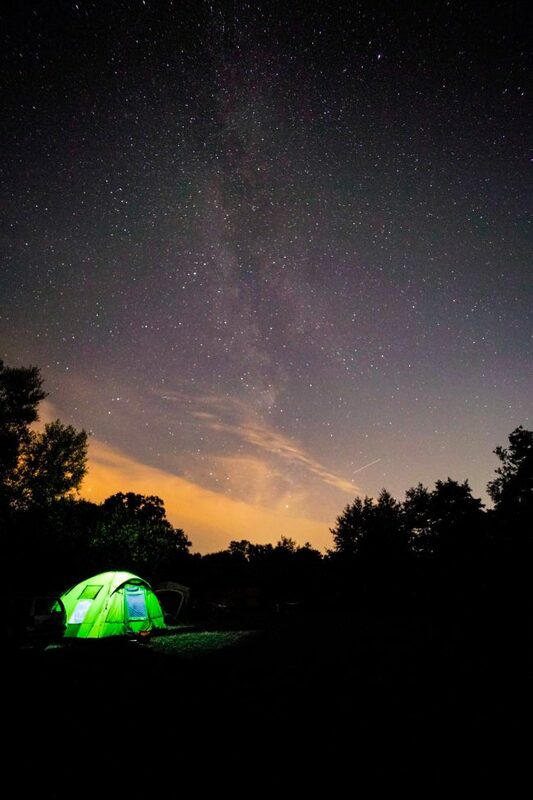 Picture credit: Many thanks to Mark Davies for the great photos, the first being of the milky way above one of our tents, and secondly the communal campfire which is hard to capture but essential part of the camping experience.